- Many companies purchase desktop thermal printers to make their plastic identity cards in-house. 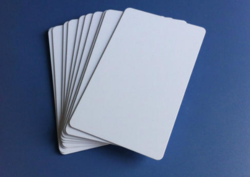 We manufacture blank or pre-printed plastic ID cards that can be used as card stock by these companies.This enables companies to print their own membership cards, ID tags, VIP cards, gift cards, loyalty cards, phone cards and more. Enriched by our vast industrial experience in this business, we are involved in offering an enormous quality range of Employee ID Card. Code :- VT 1446. I Card. Our company holds immense experience in this domain and is involved in offering wide assortment of Plastic ID Card. Supplier Of Plastic I.D. Cards, Proximity Cards, Lanyards, Die Cutter, Card Holder, Synthetic Sheets, Ropes, Contact and Contactless Smart Card.